Imagine a world that is one of infinite parallel worlds, that hangs suspended between triumph and catastrophe, the dismantling of the Wall and the fall of the Twin Towers, in the shadow of suicide terrorism and global financial collapse. Presiding over this world is the Concern, an all-powerful organisation whose operatives possess extraordinary powers. There is Temudjin Oh, an unkillable assassin who journeys between the high passes of Nepal, a version of Victorian London and a wintry Venice; Adrian Cubbish, restlessly greedy City trader; and the Philosopher, a state-sponsored torturer who moves between the time zones with sinister ease. 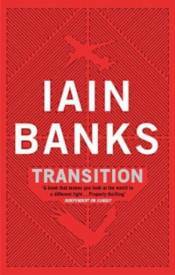 Transition is a high-definition, hyper-real apocalyptic fable for terrible times.